Do you want more info about Uri-minder™ sent to you? Click Yes to fill out a "Request More Information" form. URI-minder™ used for timed urine collection where all the urine the body produces over a specific time period to find out how well the body is working. 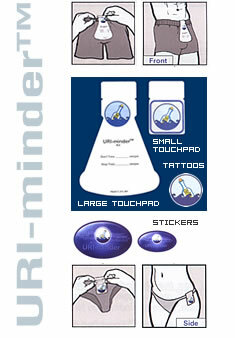 URI-minder™ memory joggers are used to make sure that patient urine collection is complete. The URI-minder memory joggers are designed so that you will either touch or see them whenever you prepare to urinate, thereby reminding you to collect your urine.